"Dhu-Loch, or the Black Loch - for such is its signification - is a sheet of water overhung by precipices of huge black granite upwards of 100 feet high, lying near the head of Glenmuick. The scenery in this neighbourhood is bold and romantic. A streamlet, running into the Loch, makes a leap of 200 feet, and other points of the Glen present some striking features. 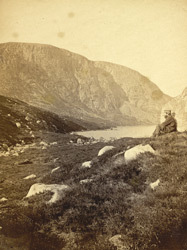 Within two miles, at the head of Loch Muick, was a Shooting Lodge of the late Prince Consort, who, with Her Majesty, spent many happy days in this secluded spot. Throughout the whole year in this Lodge dwells a Keeper, whose lot in the winter season may be envied by few, not being within several miles of any human habitation."